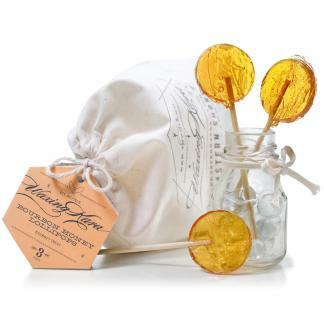 Honey Lollipops are a gourmet treat made by hand with honey from our farm. Carefully crafted with only the best ingredients for a unique, delectable confection, available in a variety of flavors. A perfect way to soothe a sore throat or the tickle of a cough. Use them to sweeten tea or coffee on-the-go. An ideal gift for the tea lover, and great for holidays and teacher appreciation. Honey Lollipops make a beautiful gift topper as well. Loved especially by kids and adults. Add a little sweetness to your day with our Honey Lollipops! Enjoy them by the bag or the box. Lavender Honey Lollipops are made with real lavender buds from our farm-a true Eastern Shore treat! We harvest the lavender by hand. If you like spice, you’ll love our Cinnamon Honey Lollipops. They’re perfect treats for when the weather turns cold to help warm you back up. 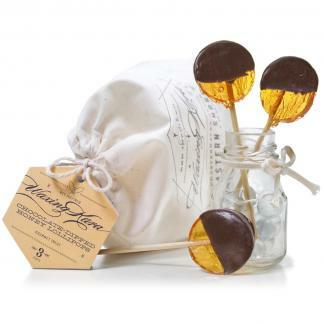 Bourbon Honey Lollipops are great for cocktails and tea-they’re a warm, sweet honey treat. Enjoy our pops in a variety of formats, some come as samplers, some with everything you need to enjoy a pot of tea on the go. Each lollipop weighs about one ounce (some are bigger than others) and measures just shy of two inches.